This Santan Sukh Yantra described by me in this post is specially meant to correct behavioral defects in spoilt and wayward children. 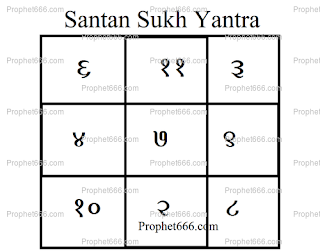 Santan Sukh in the context of this particular Yantra Experiment means happiness and satisfaction deruved from children and is suitable for harassed, anxious and fearful parents of a child who has lost direction in life. The Yantra Sadhana to be performed by a parent desiring to rectify character defects in his or his child is a simple one, which I will explain below in this post. The Yantra Sadhana should commence on a Sunday and 201 Yantras, like the one shown by me in the image have to be drawn every day. The Yantras can be drawn on white paper using any kind of ink. The Yantra Sadhana has to be continued until the parent completes drawing 2500 Yantras. Then the parent has to worship all the 2500 Yantras together by offering them flowers and lighting an Agarbatti and an oil lamp in front of them. Lastly, to conclude the Santan Sukh Yantra Prayog, the parent should immerse all the 2500 Yantras collectively in a flowing water body like a river, canal or the sea.